Bundle wrapping for my one and only under-seat bag. I have bundle wrapped my clothing around my undies, stockings and long underwear top. It’s all secured by the internal straps. I’ve put my nightgown on the outside so it is easily available. The dress is next so it doesn’t get wrinkled, followed by my skort and the blue shirt. The knit tee is last. I’ll agree with Doug on the size of Ben’s bundle. Ben is bringing 9 shirts, 3 pairs of pants, and a suit coat. That includes the clothes he is wearing. Yikes! That’s way more than any light traveler carries. Ben also comments that the bundle isn’t very friendly to TSA searches. I have never had a problem with bundle packing and security screening. I only put clothing in my core/bundle. The screening machine detects nothing because there is nothing to detect. I occasionally read claims that this is the downside of bundle wrapping: the need (or at least, desire) to unwrap your bundle whenever arriving at a new location. I personally believe that unpacking/hanging one’s clean clothes upon arrival is always a good idea, whatever the packing method. If you do find this a significant inconvenience, your problem is more likely to be with overpacking than bundle wrapping. Typically, the task takes but seconds, as few items are involved. Further, a little practice makes one quite proficient, and even the full (re)wrapping process should take less than a minute. I couldn’t agree more. Bundling is by far the lightest method to organize clothing in your bag. 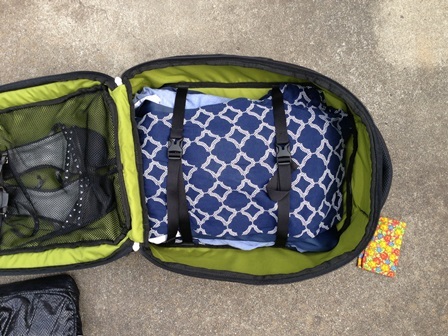 The lightest weight packing cube is none at all. Great posting, thanks for sharing the video and Doug’s comments. You are my go-to advisor for one bag packing for women. Being a plus-size lady my bundles are larger, but certainly doable for hand carry only.